Recorded on January 17, 2010. 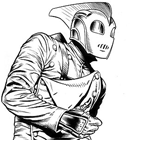 This week on Gutter Trash, we review Dave Steven’s The Rocketeer Complete Collection. Music by Legbone, Black Wolf Fight and Marcy Playground. Maybe I’m just comic retarded, but I really felt like Rocketeer had flow problems with the word balloon placements. Like you I was always aware of Rocketeer, but had never read it. I was always under the impression it was a renewal of an old book (like The Spirit or The Shield or Black Hood (all of which were relaunched around that time)). So I have to say I’m impressed he could make something so iconic with such little output. Of course how many issues of the Turtles were there before they were a hot property? Looking forward to From Beyond. A more recent movie in the same style of goodness is The Attic Expeditions. I agree with you about the word balloons. I’d like to say it was the fault of a young writer/artist still getting his bearings on what do correctly, but I see that problem in a ton of mainstream books produced by seasoned professionals. So I’m probably just used to getting confused as to what I’m supposed to read. I think I even read something recently where there were arrows pointing to the correct panel to read next, but it was almost like the artist thought he was drawing manga and laid the page out backwards. Hell, maybe that was in the Rocketeer. My memory is awful. I think it was in My Inner Bimbo. Sam Keith is big on drawing arrows to help with confusing page design. I think Rocketeer maybe had one set of arrows. Who knows who actually puts in the word balloons on the big books at Marvel. Probably the same dude that fills the toner in the copier.